iPad is the tablet line released by Apple. It has several sets of models, from initial iPad, iPad mini, iPad Air and the latest iPad Pro. iPad is recognized as one of the best gadegets to play HD movies for the Retina Display and reasonable screen size. However, iPad doesn't support DVD. In this article, we will list iPad supported formats and show to convert DVD to H.264 MP4 on Mac for later playback on iPad. • H.264 video (up to 720p, 30 frames per second; main profile level 3.1 with AAC-LC audio up to 160 Kbps, 48kHz, stereo audio in m4v, mp4, and mov file formats). • MPEG-4 video (up to 2.5 Mbps, 640 by 480 pixels, 30 frames per second, simple profile with AAC-LC audio up to 160 Kbps, 48kHz, stereo audio in m4v, mp4, and mov file formats). WinX DVD Ripper for Mac is the best solution to convert DVD to H.264 MP4 for iPad on Mac. This DVD ripper or converter for Mac is dedicated by Digiarty Software and gains great popularity among Mac users. And the most important point is it can convert DVD movie to the iPad supported video formats, like H.264 MP4 and MOV, convert DVD audio to iPad supported music format, convert DVD single frame to iPad supported image file. That is where "Best" comes from. * Convert DVD to Video and Audio supported by iPad on Mac. * Convert DVD to iTunes, iMovie, Final Cut Pro X with Ease on Mac. * Adjust parameters: Resolution, Aspect Ratio, Frame Rate, Bit Rate etc. * Make 1:1 DVD Copy, Backup DVD to iTunes iPad for Mac. * Make perfectly 1:1 DVD Copy, Backup DVD to iPad Wi-Fi 3G for Mac. * Extract Audio and Picture from the Videos and stored in iTunes iPad. * Advanced Flexible Functions for DVD to iPhone iPod iPad Conversion. PS: For ripping DVD to MP4 in Windows, WinX DVD Ripper Platinum is the best choice, which is capable of ripping DVD to MP4, AVI, MOV, FLV, iPhone, iPad, iPod, etc, best DVD ripper for Window 7/8/10. Click one: load the DVD with DVD button. Click two: choose the output format. Click three: select the output folder. Click four: Get to Start DVD to MP4 Conversion on Mac. WinX DVD Ripper for Mac continuously updates to support converting and ripping DVD with the latest copy protections. So you can frequently upload the latest DVD movies onto H.264 MP4 for iPad on Mac. On the other hand, your old DVDs and even some scratched DVDs can be ripped with whole movie as MP4 for watching on iPad. 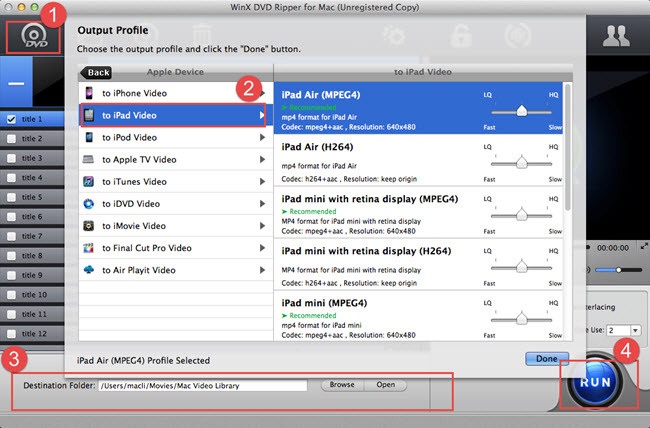 For the detail information about how to convert DVD to H.264 MP4 for iPad on Mac you can check WinX DVD Ripper for Mac's User Guide. Learn how to convert DVD movies/TV episodes to any iPad mini, with idea on best quality profile settings for DVD ripping. Play DVD on iPad Pro 2 – How to rip DVD to iPad Pro 2? 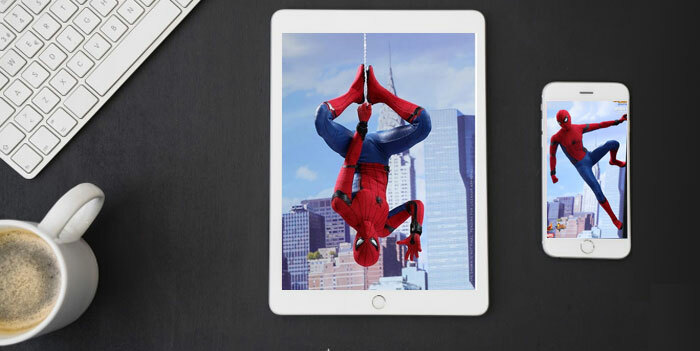 Best DVD to iPad ripper to rip DVD to MP4/MOV for playback on 2018 new iPad Pro 2.
his guide will teach you how to use free DVD ripper for Apple iPad to rip DVD to iPad Air/miniPro etc.